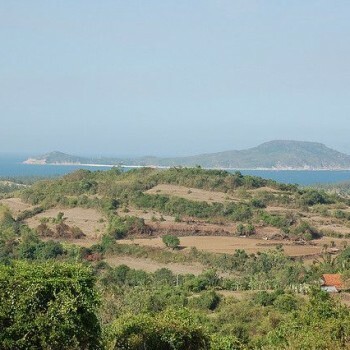 Phu Yen-a fertile land which is not only well-known for crystal clear lagoons, tremendous beaches or awesome cliffs, but also for breathtaking bays. Let’s follow Daily Travel to Xuan Dai Bay-one of the most fascinating landscape which will blow you mind right away of this “Nau” land. 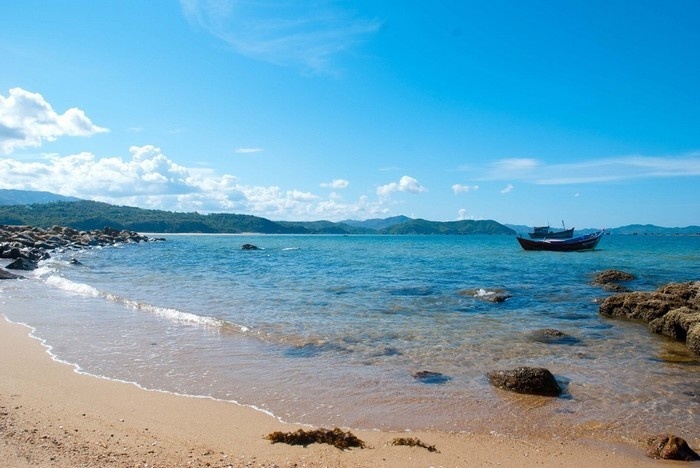 Located on National Highway 1A, the bank of Xuan Dai Bay is 50 kilometer length, runs from Song Cau Commune to Tuy An District in the North of Phu Yen. Xuan Dai Bay scenery appears like a beautiful ink painting. The Bay was formed by mountain ranges that run to the sea for about 15 kilometers. At first glance, the whole view looks like a unicorn’s head. Three sides of the Bay are surrounded by mountains ranges spread to the sea. The face of rocks, which are adjacent to the sea, have been eroded over times by waves and now results in many exotic shapes. There are not so many bays which have such a majestic topography like Xuan Dai Bay, on which rock cliffs, rock reefs, puddles, mountains all take place windingly in a series. Only puddles, Xuan Dai Bay has more than 10 that are different in size and depth. Xuan Dai Bay is also known as a mark in Vietnamese history. In the ancient time, there was a naval battle between Tay Son army and the Nguyen Dynasty happened here. 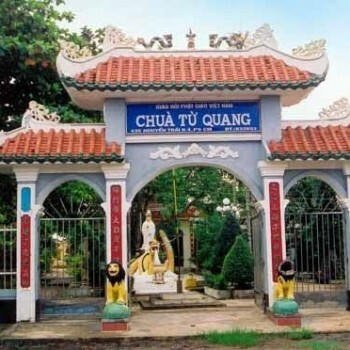 Xuan Dai Bay was the first place of diplomatic relation between Vietnam and America. 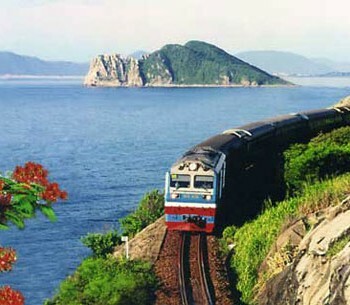 The region used to be the capital of Phu Yen for a long time. 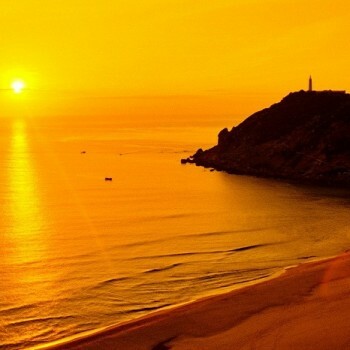 Xuan Dai Bay is endowed with a stunning charm, which obviously can magnetize any tourists at first sight during Phu Yen trip. On this natural wonder, you will get an eyeful of the nature painting, which has poetic mountains blended with crystal clear water and smooth, pure and far-reaching sands. Besides flat and lovely beaches, there are undulating cliffs unfolded in many colors under the sun. Sailing in the wind to discover Xuan Dai is the good way to see more magical things. Once you learn about fishermen life on Xuan Dai Bay, you will find that they are generous, outspoken and lovely people, who withstand difficulties with optimistic mind. 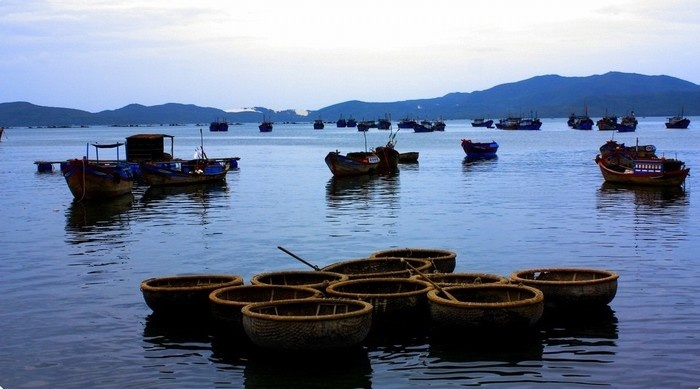 Along the Bay, there is Thanh An village, which is famous for its traditional fish sauce making. The craft is still remained up to the present. 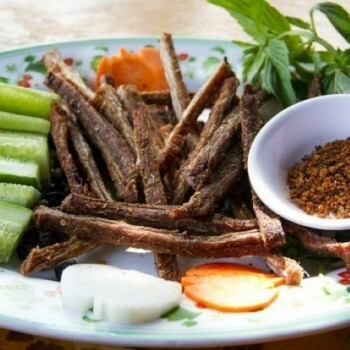 Even Thanh An fish sauce is not developed as strong as in Phan Thiet-Binh Thuan or Phu Quoc-Kien Giang, it is still commonly used in Phu Yen and its neighbor provinces. Here, tourists can also explore the pristine nature, crowded neighborhoods living close-knit but still persisting the purity of the nature. 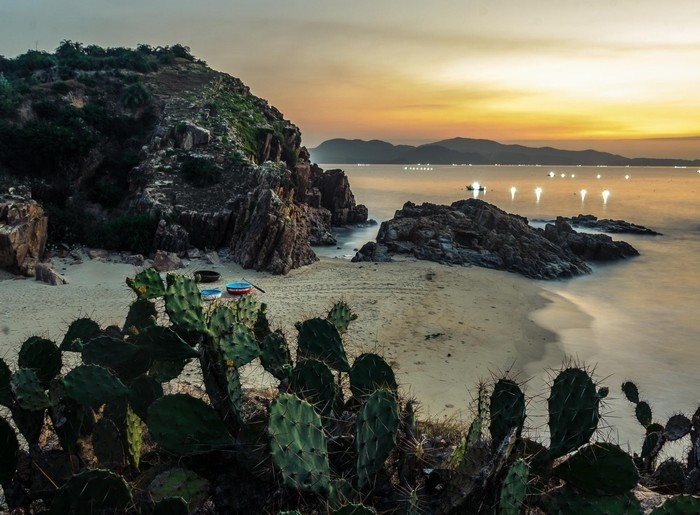 In particular, Xuan Dai Bay-a typical landscape of Phu Yen province is not only nominated as the most beautiful bay in the world, but also bring a major economic benefit. The advantageous natural condition here is suitable to aquafarm sea products, such as: fishes, lobster and so on. 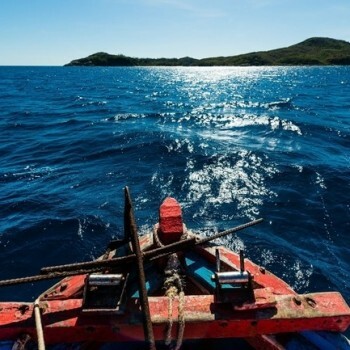 From Dan Phuoc Wharf (Song Cau town, Phu Yen), tourists can visit many smaller islands by boats, such as: Hon Yen, Nhat Tu Son Islands, Ong Xa Island… in the middle of the Bay. 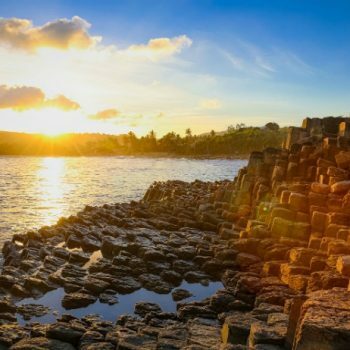 There are also other places around the Bay that tourists can stop by, such as: Ganh Den Reef, Ganh Den Lighthouse, Binh Sa beach and so on. Ganh Den Reef is a part of Cay Me mountain range surrounded it, where there are cliffs piled on each other and create an impressive risky terrain. On the top of the Reef is Ganh Den Lighthouse which guides fishing boat during the night. Binh Sa beach is another appealing attraction, where the casuarina trees produce a melody harmonized with the sound of the sea. 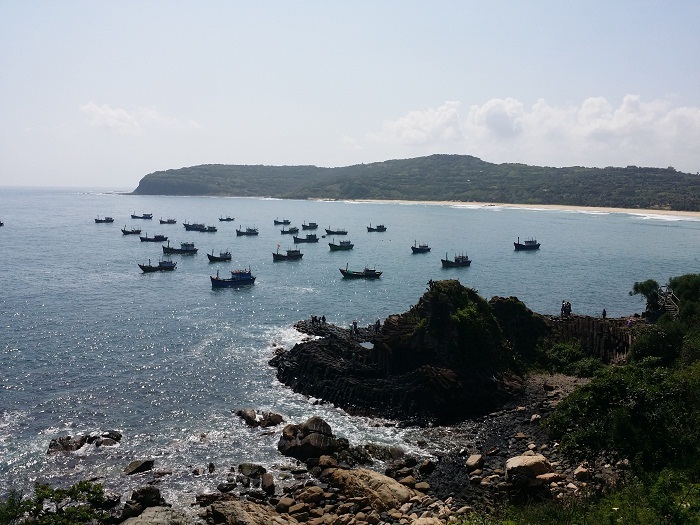 Xuan Dai Bay also has many low mountains that runs out to the sea, which divides the surface into smaller channels. The bases of those mountain ranges has formed many beaches and reefs. 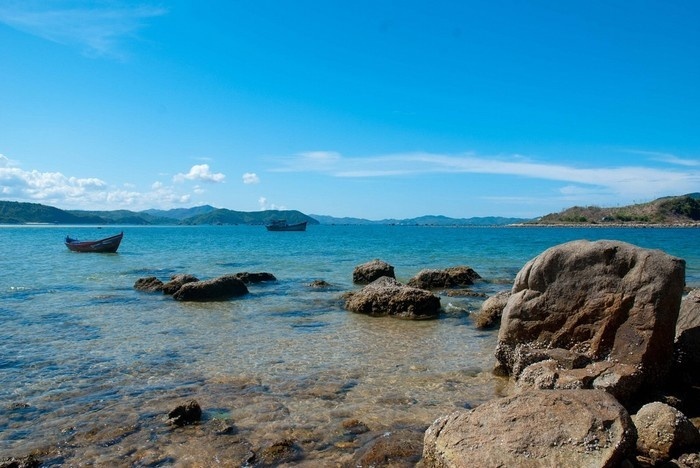 Near the bases of Bo Island, Mu U mountain, there are Lo Tra, Than beach, Nhau beach, Ban beach…Even though those beaches are not large, the spaces are enough for tourists to relax, have an over-satisfying sightseeing and experience with the nature. The scenery looks more serene and calm with the view of numerous small and large islands. 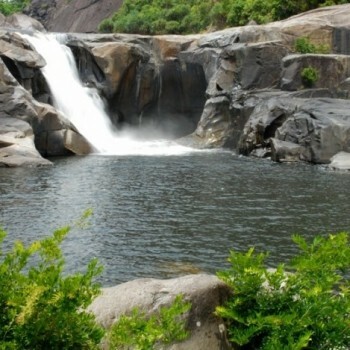 Besides, tourists can also visit other exciting and attractive destinations of Nau land during the way to Xuan Dai Bay on National Highway 1A, such as: Cu Mong Lagoon, O Loan Lagoon… You will have a chance to talk and learn more about many difficulties of the coastal life that the locals here face throughout years. One thing could not be forgotten is the tasty sea flavor cuisine here with: O Loan blood cockle, crab, flower crab and so on. 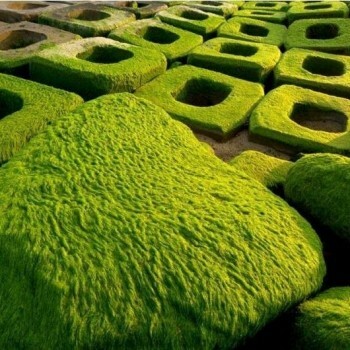 The quality which is always highly appreciated would definitely captivate tourists right away.